There are a number of orchestras here which also remind us of those days when everything was calmer and more sedate. 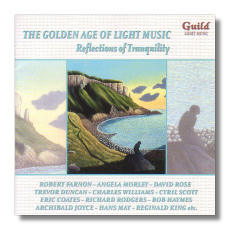 Sidney Torch, Monty Kelly, Robert Farnon himself and Walter Collins were all stalwarts in their day and the lovely pieces recorded here are definitely fine memorials of their art. In his usual indefatigable manner, David Ades manages to conjure a mix of the familiar and the almost totally unknown. There is Eric Coates' classic 'Under the Stars', and Joyce's 'dreaming' but I confess that I was completely unaware of such obscure pieces as Haymes' 'Beyond the Next Hill' or Hans May's 'Rippling Down the Mountain'. However the compilation fits together so seamlessly that it would be rather impertinent to keep on discussing individual items. David Ades' notes continue to make essential reading for the lover of this genre and this is fast superseding Dutton Laboratories' equally magnificent efforts in this field with their volumes on the Queen's Hall Light Orchestra, Mantovani and other stalwarts such as George Melachrino and Robert Farnon. Guild's remastering is predictably excellent and I would urge all those lovers of this beautiful genre to snap this CD up without delay.